Have you all seen this trick? 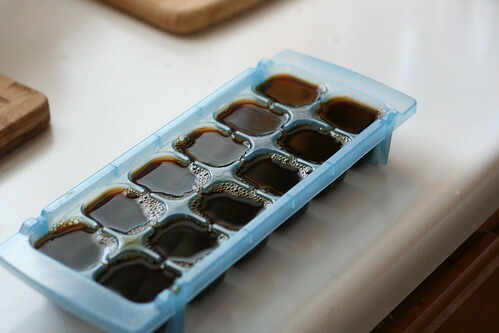 Next time you brew a pot of coffee, make an extra cup, pour it into an ice cube tray, and freeze. Then when you're craving iced coffee on a hot summer day, you can use the coffee ice cubes instead of water ones... no diluted coffee! You can do the same thing with tea, or even juice or lemonade. No one wants a watered-down beverage, right? It did take almost the whole tray to make my freshly brewed hot coffee suitably icy, so save these up for a single-serving special treat. Its an interesting idea, though I don't think it will take off in Scotland. Iced coffee has never been high on the list in the U.K, something to do with all that rain I thin, but I still like the idea. Thanks for sharing. Ah-huh, been wondering how to overcome this problem! The knowledge of the coffee lover’s dictionary is one of the first ways to master a supper delicious cuppa. With such knowledge, we can offer tips on a variety of coffee tastes based on regions, dairy, beans, blends, as well as water ratios to serve our readers based on diverse flavors, tones, and layers of coffee coffeetesters.com. It's not hard to be good whenever things proceed easily but when there's a problem this is when you discover how good a company really is. In the past I've used roofing companies which were nowhere found after the examiner clears. Shelton Roof covering provides superb assistance in the many years because setting up the rooftop pop over to this website.